Macronutrients, specifically carbohydrates, fats and proteins, are energy providing substances the body requires in relatively large quantities. Together with micronutrient vitamins, minerals, enzymes, trace elements and phytonutrients, macronutrients provide essential nutrition necessary to thrive, as well as support proper function and good health. Of these, getting sufficient protein intake may be uppermost in minds of those who are paying close attention to their diets. Yet many official nutrition organizations recommend a fairly modest protein intake for most people. There are certain groups of people who do benefit from a larger proportion of protein in their diet relative to fats and carbohydrates. This can include body builders, elite athletes, dieters or those with dietary restrictions, as well as seniors seeking to counteract muscle loss often associated with aging. While high protein diets for weight loss have been trending for several years, many healthcare practitioners tout a largely plant-based, whole food diet with healthy combinations of nutrients for overall good health, weight management and proper bodily function. We may think of protein strictly in terms of dietary intake, yet proteins in various forms provide the structure for all living things. In the human body, protein substances make up the muscles, ligaments, tendons, organs, glands, hair and nails, as well as vital body fluids, enzymes and hormones. In order to build specific proteins required, the body must first break down dietary protein into its constituent amino acids. Held together by a peptide bond, amino acids are comprised of hundreds or even thousands of smaller units attached to one another in long chains of polypeptides. As proteins are not interchangeable, the sequence of these links determines their unique functions and characters, with each protein tailored for a specific need. So while we think in terms of protein’s role in nutritional health, it is actually amino acids that are vital to the chemical processes that sustain life. In order to perform biological functions, the body typically utilizes 21 types of amino acids. Certain conditionally-essential and nonessential amino acids can be synthesized by the body. Ten are deemed essential amino acids, as they cannot be produced by the body and must be obtained from dietary plant or animal protein sources. 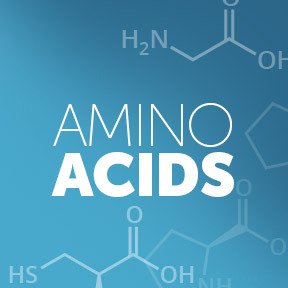 Amino acids are necessary for cellular growth, as cells continually break down and rely on a fresh supply of amino acids to build new proteins. They also serve as precursors from which the body produces the remaining non-essential amino acids. As well, certain amino acids act as neurotransmitters or precursors to neurotransmitters that carry information between cells. Because some amino acids can pass the blood brain barrier, which functions to protect brain tissue, they can be utilized by the brain to communicate with nerve cells elsewhere in the body. Optimal balance of amino acids in the diet and in circulation is crucial for whole body homeostasis. In additional to their protein building roles, amino acids regulate key metabolic pathways necessary for growth, maintenance, reproduction and immunity. Just like protein, amino acids provide an energy source of 4 calories per gram. Certain amino acids are converted into other amino acids, proteins, glucose, fatty acids or ketones. Specific amino acids function as neurotransmitters in the nervous system. Some amino acids are key precursors for neurotransmitter and amino acid based hormone synthesis. Specific amino acids are precursors to nucleic acids, parts of DNA. Branched chain amino acids are thought to stimulate muscle recovery and may decrease muscle soreness after exercise. In individuals with sleep disorders, amino acids hydroxytryptophan and GABA taken before sleep can reduce time to fall asleep, and support sleep duration and sleep quality. Supplemental amino acids may help to balance chemical messengers in the brain including epinephrine, norepinephrine, dopamine and serotonin, aiding healthy mood, focus and quality sleep. Dietary supplementation of amino acids may be beneficial for ameliorating health problems, including obesity, diabetes, cardiovascular disease and metabolic syndrome. Amino acids may optimize efficiency of metabolic transformations to enhance muscle growth and athletic performance, while preventing excess fat deposition and reducing adiposity. Insufficient vitamin and mineral intake, especially vitamins C and B6 can interfere with the absorption and transport of amino acids. Vitamins and minerals require amino acids for performance, absorption and assimilation. The process of breaking down proteins into amino acids, as well as assembling amino acids to make proteins, is continuous. The body produces different types of proteins as the need arises. Impaired absorption, infections, trauma, stress, age, and imbalances of other nutrients may all contribute to deficiencies of amino acids. Failure to supply the body with sufficient amino acids daily can hinder the synthesis and reduce body levels of necessary proteins. This can lead to a gradual breakdown of tissues, such as found in muscle wasting, as well as a negative nitrogen balance. When the body lacks sufficient nutrients, it struggles to properly carry out bodily and cognitive functions. In order to reduce the risks of metabolic disorders, optimal nutrition can be achieved with a healthy varied diet, as well as intake of vitamins, trace elements and minerals to replace what is utilized each day to promote overall vitality and wellbeing. Free Form Amino Caps by Douglas Laboratories®: This formula provides a nutritionally balanced blend of essential, conditionally-essential and non-essential amino acids in their physiological L-crystalline forms. Free of wheat gluten, soy, yeast, dairy, sugar and artificial coloring, preservatives and flavoring. Contains phenylalanine. Amino Acid Base Powder Unflavored by Metabolic Maintenance®: This powdered proprietary formula provides therapeutic levels of nine amino acids blended with vitamin B6 and bio-activating agents for optimal utilization. Gluten and lactose free, vegan formulation. Contains phenylalanine. Amino Acid Complex by Professional Complementary Health Formulas: This high potency formula provides a balanced blend of 19 naturally occurring amino acids for overall good health and maintenance support. Contains phenylalanine. Essential Aminos by Pure Encapsulations®: This hypoallergenic formulation provides free form amino acids in support of healthy muscle and body tissues. Gluten and soy free, Non-GMO vegetarian formulation. Super Shake Plus – Vanilla by Nutritional Frontiers: This hypoallergenic meal replacement powder provides a delicious protein alternative suitable for vegans and vegetarians, as well as those with food allergies or sensitivities. Provides 20 g of pea, rice and pumpkin protein with a full complement of amino acids per serving. Gluten and soy free, Non-GMO vegan formulation. Chocolate formula also available. Contains phenylalanine. Products containing phenylalanine should not be combined with Parkinson’s medications, MAO inhibitors and tricyclic antidepressants. Those who are pregnant, lactating, have a health condition or are taking medications, please consult a healthcare practitioner before using any supplements. Phyllis A. Balch, CNC. Prescription for Nutritional Healing. The Penguin Group; fifth edition, 2010. This entry was posted in Home and tagged Amino Acid Base Powder Unflavored by Metabolic Maintenance, Amino Acid Complex by Professional Complementary Health Formulas, Amino Acid Primer, Essential Aminos by Pure Encapsulations, Free Form Amino Caps by Douglas Laboratories, Super Shake Plus – Vanilla by Nutritional Frontiers. Bookmark the permalink.